Frances Winston really found this film engaging, with a tiny superhero who really packs a punch! Even by the often outrageous standards of the Marvelverse, Ant Man shouldn’t work. Although I am a big comic book fan, even I find the idea of a minature superhero a bit hard to comprehend. I mean, he’s teenchy! Ant-size in fact. It just seems like he wouldn’t be much use in a fight. Apparently I am wrong though, as this tiny titan really packs a punch! The titular character is played by Paul Rudd, an actor who, until now, was best known for being a supporting goofball in various comedy flicks, and Phoebe Buffay’s husband in 90s sitcom Friends. A likable enough actor, but not one that immediately springs to mind when you think hero. However, he plays a character called Scott Lang, a petty thief and everyman, and his likeability and “ordinariness” really suits the role. Lang is just out of prison, and despite wanting to go straight, he is persuaded to perform one last heist in order to raise enough money to pay his child support and see his daughter. 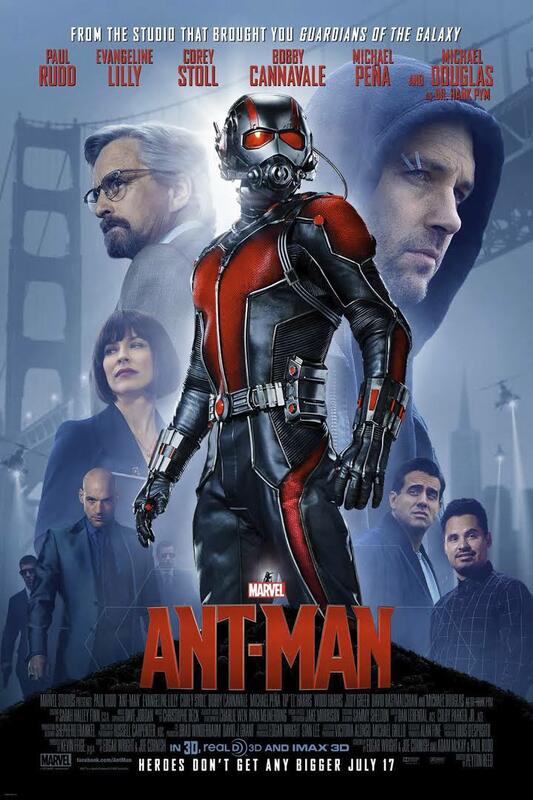 However, this is no ordinary heist, as he has been set up by ageing scientist, Dr Hank Pym (Douglas) who sees him as the natural successor to wear the Ant Man suit he had invented decades beforehand. Stealing the iconic suit, Scott finds himself thrown into a tiny, tiny, world, when he inadvertently shrinks, and once he gets over the initial shock, he becomes Hank’s protégé, as they work together to stop the power-mad Darren Cross (Stoll), who now runs Hank’s company, developing similar technology which could fall into the wrong hands, and possibly destroy to the world. Much like last year’s excellent Guardians of the Galaxy, this is a movie that shouldn’t work, but does. Excellent casting, and a script that is just the right side of twee and ridiculous (just) ensure that the viewer never gets bored. The pacing is perfect, and despite a couple of cheesy moments, on the whole it is incredibly engaging. There are also plenty of laughs along the way, as as you would expect when you have a leading man with such a comic pedigree. Even the fact that our hero is so small cannot detract from how big this movie is. A sequel is already in the works (and shamelessly set up in not one but TWO post credit sequences) and if they can match the warmth, humour, and action of this film, they could well be on to a winner. Great fun for both kids and adults, you may even find yourself googling ants afterwards! You have been warned – this film makes insects cool!